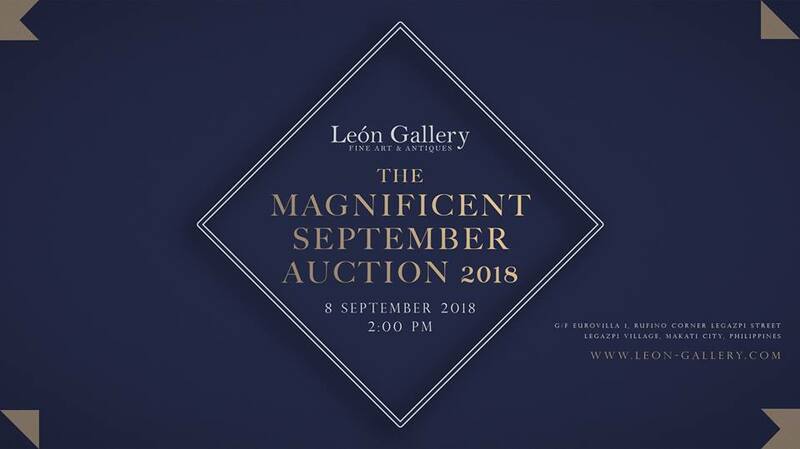 León Gallery is pleased to announce The Magnificent September Auction 2018 featuring important works of Philippine art, fine antiques and furniture on the 8th of September 2018, starting at 2PM at Eurovilla 1, Legaspi Street corner Rufino Street, Legazpi Village, Makati City. Check catalog here. This auction is in partnership with the Museum of Contemporary Arts and Design (MCAD) of the De La Salle-College of Saint Benilde, as part of its Funding the Future project in order to raise funds for its academic endeavors in modernizing its programs in terms of research and artistic exchanges in the contemporary visual arts. Works donated by renowned contemporary artists shall be auctioned off, in part, to benefit the programs of the MCAD. 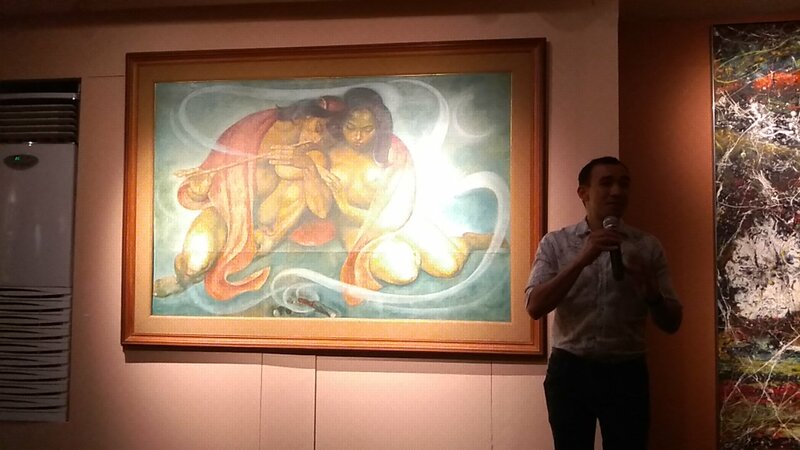 Headlining our sale of Philippine art is an important work by National Artist Carlos “Botong” V. Francisco. “The Nose Flute” (1955) depicting a courtship ritual of two lovers in the context of the Cordilleras. It is considered as one of the finest masterpieces made by the artist in his lifetime and was once owed by Lovina-Palileo family. This work is considered as one of the best and biggest masterpieces of the artist and was painted during his best period. Also, this was last seen by the public in 2012 when it changed ownership and has taken a decade to make its way back to the country. 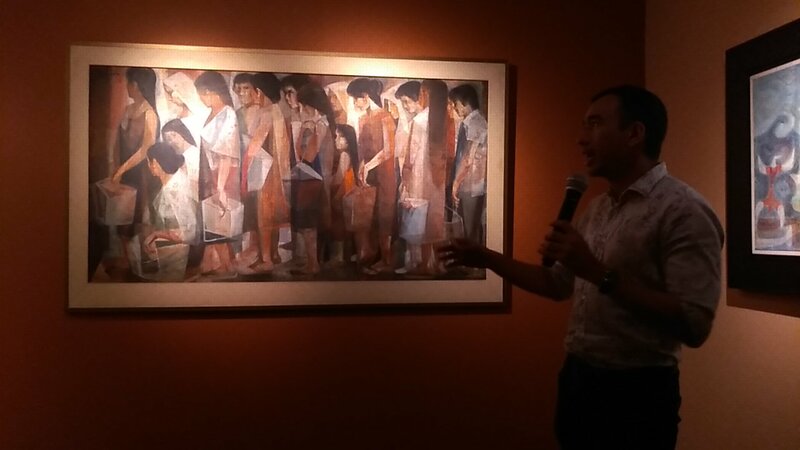 A major highpoint of the upcoming auction is “Pila sa Bigas (Queuing for Rice)” a mixed-media work by Vicente Manansala. It features 17 ordinary folks all lined up and with tin cans waiting for their turn to buy or maybe even ask for rice. Another fantastic work by the artist is “Mga Sabungero (The Cockfighters)”, all from the collection of the late Ambassador J.V. Cruz. Another highlight is “Saeta 52” (1958) by the foremost abstractionist Fernando Zóbel y Montojo. This painting has been repatriated back in the Philippines. It was first exhibited at the prominent Philippine Art Gallery (PAG) and is considered as one of the rarest large-scale canvasses of this series by Zóbel. This is considered an exceptional painting because there are only 10 known paingings of this size painted by the artist and most of these are in museums and public collections already. “Cross-Section/Ascension” (1956-57) by the modernist Alfonso Ossorio is one of the most riveting symphonies of color that the expatriate Filipino-American artist has ever produced. It is believed that Ossorio painted this for his friend Jackson Pollock since it was done right after the death of the latter who was on his way to Ossorio’s house in the Hamptons when he had a tragic car accident. Painted by Fernando Amorsolo, “Dalagang Bukid (The Country Lass)” (1927) is considered as one of the earliest known works centered on Amorsolo’s ideal muse in his idyllic rural pastures bathed in sunlight. 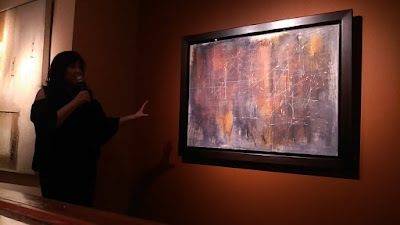 The work has a stellar provenance and was previously owned by the painter Fernando Zóbel. Other important works or art include a masterpiece by National Artist Jose Joya, “Carnival” (1964), rediscovered from the Mark and Naheed Houshmand Collection and two important works from the “Stations of the Cross” series by Ang Kiukok. Commanding pieces from BenCab, Cesar Legaspi, Arturo Luz, H.R. Ocampo, Nena Saguil, Lee Aguinaldo, Juvenal Sanso, Romeo Tabuena, Malang Santos, Pacita Abad, Romulo Olazo and Romulo Galicano, Manuel Ocampo, Ronald Ventura, Alfredo and Isabel Aquilizan, Rodel Tapaya, Emmanuel Garibay as well as the works of today’s young guns, Mark Justiniani, Jose John Santos III, Keb Serda, and Louie Cordero are also highlights of the forthcoming auction. Significant pieces of antique furniture are also featured in this auction, carrying distinguished pedigrees attached to them. Furniture designed and carved by the master Eduardo Ah-Tay and his Binondo workshop, known for their impeccable workmanship and meticulously detailed carvings of Filipino and Chinese motifs are highlights in this sale. A significant piece is a four-poster Ah-Tay bed commissioned by the Pardo de Tavera Family, one of the most affluent families in the 19th century. Also included is a pair of estilo Louis Quinze arm chairs done in the third quarter of the 19th century also done by Ah-Tay. One of the gems of this auction is a kamagong cabinet crafted in the second quarter of the 19th century from the estate of Dr. José Fernandez Fabella, one of the pioneers of modern Philippine healthcare system and the Secretary of Health in Quezon’s cabinet. This cabinet was carved with fine inlays of carabao bone and actuated on its top with urn-like finials, which have been lined with silver and lanite. Important furniture featured from the collection of Dr. Alejandro Roces Legarda is also on offer. A secretary desk (better known as an escritorio) drawn from the Edwardian-style of the 20th century that has been created from narra. Noteworthy in this sale are items of fine Philippine objet d’ art, starting with a gilded silver monstrance used in receiving in communion of the Catholic liturgy, made in the second quarter of the 18th century and a set of 19th century ornate silver crowns commissioned to adorn religious images; both have been sourced from the Richard and Sandra Lopez Collection. Exceedingly rare and historically important documents such as the “Decalogue” or Ten Commandments of the Katipunan which was handwritten by Andres Bonifacio will also be included in the auction. A letter from Josephine Bracken to El Presidente Emilio Aguinaldo plus a letter from National Hero Dr. Jose Rizal to the Scottish millionaire based in the Philippines, Mr. Alejandro Macleod, whom he personally thanked for giving shelter to his sisters, Lucia and Trinidad. Once a recruit was inducted into the society, their ranking shall be determined by the “Kataastaasang Sangguinian” (Supreme Council) as represented by a ceremonial medal featuring two crossed bolos. These important documents and artifacts were sourced from the collection of the eminent Philippine scholar Epifanio de los Santos, whose literature and scholarship helped in detailing the true narrative of the Philippine Revolution. It is fitting that in anticipation of the release of an upcoming film “Goyo” featuring Gregorio del Pilar, military memorabilia from his own regiment will be on the auction block. Two epaulets and hand-drawn designs of the revolutionary uniform created by none other than Juan Luna will go under the hammer. These designs were commissioned by his brother, General Antonio Luna. 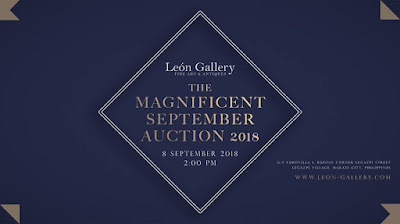 The preview of “The Magnificent September Auction 2018” shall run from September 1-7, 2018 at León Gallery located in Eurovilla I, Legaspi Street corner Rufino Street, Legazpi Village, Makati City.